If recent headlines are anything to go by, at-home genetic test kits provided by DNA testing companies like 23andme and Ancestry.com continue to be controversial. The biggest caution from organisations such as the Alzheimer’s Foundation of America was the life-changing and long-term implications of test results. DNA testing companies, critics say, distil your DNA into a compendium of ancestral, medical and biographical insight that is either medically incomprehensive or provide information that is misleading as consumers may not be able to interpret test results. However, while objections about the scientific validity of these home kits are frequently raised, there is less dispute surrounding medical genetic testing, which uses blood samples or sometimes through saliva or skin biopsies to look for changes in your genes. 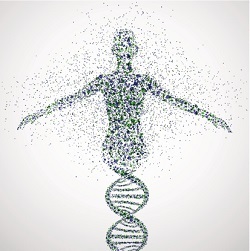 Genetic testing can identify rare genetic conditions and a patient's risk for specific diseases. Having a GP refer a patient based on the strength of family history and meeting certain criteria means there’s a more supportive network behind these tests, where professionals interpret your results in context and in tandem with genetic counselling. In the UK, genetic testing is pivotal to the future of healthcare. In December last year, the 100,000 Genomes Project, which began in 2015, hit its 100,000 milestone sequencing whole genomes from NHS patients. The programme according to Genomics England, the government-owned entity running the project, helped to pole vault the UK as a world leader when it comes to whole genome sequencing at scale in direct healthcare. The promise and progress of genomic medicine towards ‘precision medicine’ where treatments are tailored to individual patients is becoming fully realised. Since October 2018, hospitals in England are connected to one of seven Genomic Laboratory Hubs that can test, analyse and interpret DNA enabling quicker diagnoses for those with a rare disease. The transformative service builds on the genome sequencing project allowing for more effective and quicker drug therapies. Some cancer patients, for example, will now routinely have their tumour DNA tested for mutations, which will allow for targeted drug therapies or allow for participation in experimental drug therapies. For older adults, medical genetic testing can reveal a preponderance of genetic health information that depending on a patient's perspective can mean preparation or a fountain of worry. Not every condition has a corresponding genetic test although the number of genetic conditions is increasing. The current focus on cancers and rare diseases is where genetic testing can produce the most benefit but in the future, a welter of other early-onset diseases like diabetes or Parkinsons could be screened for. According to Genetic Disorders UK, there are thousands of possible genetic tests and more are under development. There are specific types of cancers that are a result of an inherited gene fault. Currently, testing for gene faults is only available for breast cancer, ovarian cancer, bowel cancer, womb cancer and prostate cancer. Assessments for genetic testing are made on the basis of family history. Other rare gene faults that can be tested include kidney cancer, melanoma skin cancer and thyroid cancer. There are other rare diseases that can be tested and there is a great deal of information to wade through about the process. Thankfully there are a number of charities and organisations able to guide patients through and these include Genomics England, Eve’s Appeal, Cancer Research UK and Genetic Disorders UK. Despite the sophistication and increasingly common use of genetic testing, there is understandable anxiety. Research carried out in October 2018 by the American Association for Retired Persons (AARP) and the University of Wisconsin showed that more than half the adults' ages 50 to 64 surveyed were interested in genetic testing and around two-thirds were interested particularly if the test were for a disease that ran in their family. But beneath the enthusiasm bubbled an undercurrent of anxiety. The study revealed that while a large majority (90%) agreed genetic tests provided a window into future health risks, two-thirds thought genetic testing could lead to more worry about future health. A conundrum for this age group who are more askance of the benefits versus the risks of genetic testing overall suggests communication about both are not robust enough in the general population. Eve’s Appeal, a UK charity raising awareness about gynaecological cancers, say a common question they receive about women’s cancer is how it will affect other family members. It is a deeply personal and difficult decision to make whether to have a genetic test. Cancer Research UK offers a list of questions for patients to ask their GPs to start the conversation. The charity makes it clear that ultimately it is a choice. Some people have looked at the benefits and disadvantages and simply opted not to take a test to determine whether they have a higher risk of cancer.